With just three weeks to go before the final launch of the Space Shuttle, Atlantis remains on course for her big day on July 8. Meanwhile, NASA and mission managers met this week for the main Flight Readiness Reviews (FRR). 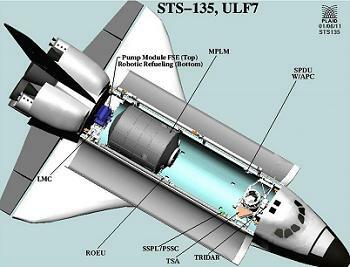 During the Mission Operations Directorate (MOD) FRR, the STS-135/ULF-7 flight timeline was thoroughly reviewed ahead of clearance to proceed to the Space Shuttle Program FRR on June 21. Targeting launch on Friday, 8 July 2011 at approximately 11:26:46 EDT, the STS-135/ULF-7 flight of OV-104 Atlantis will be a 12+0+2 day non-SSPTS mission – meaning there are 12 nominal flight days, zero on-orbit extension days, 2 landing contingency days, and no ability to draw power from the International Space Station. The mission will feature seven (7) full days for docked operations between Atlantis and the International Space Station, plus one docking day and one undocking day, 1 scheduled EVA (Spacewalk) by the ISS crew, and 30 hours of middeck transfers to and from Atlantis and the ISS. During the docked operational period (assuming a launch in the July window), Atlantis will be docked to PMA-2 on Node-2 “Harmony,” two Soyuz vehicles will be docked to MRM1 and MRM 2, the 42P Progress will be docked to DC1, and the 43P Progress docked to SM aft. Atlantis’s crew will consist of Commander Chris Ferguson, Pilot Doug Hurley, Mission Specialist 1 Sandy Magnus, and Mission Specialist 2/Flight Engineer Rex Walheim. Together, they will make up the only 4-person Shuttle crew to launch to the ISS and the smallest Shuttle crew since the 4-person STS-6/Challenger crew in 1983. The International Space Station’s Expedition 28 crew will consist of Commander Andrey Borisenko, Flight Engineer (FE) Ron Garan, FE Alexander Samokutyaev, FE Sergei Volkov, FE Mike Fossum, and FE Satoshi Furukawa. At liftoff, Atlantis will carry a full 5 tank Nitrogen load and a near-full 5 cryo tank load for her Fuel Cells – there will be a 375 lbs offload of cryo oxygen. Pad hold time from PRSD load in the launch countdown through the eventual launch will be >96 hrs, with cryo oxygen being the limiting consumable. Atlantis’s water tanks will also undergo a standard 180 lbs offload during final prelaunch activities. Atlantis will launch with one powered GLACIER freezer and one powered CGBA. Both of these payloads will be powered from launch through landing. Atlantis will also carry with her equipment to facilitate two contingency EVAs should either the ET umbilical doors fail to close and latch after ascent/ET separation or the Payload Bay Doors fail to close automatically at the completion of the mission. Furthermore, Atlantis’s Primary Logics and Drivers will be powered from prelaunch through docking to “mitigate orbiter PCA issue” observed on previous flights. Finally, Atlantis will carry 31 LiOH (Lithium Hydroxide) canisters for carbon dioxide removal from her crew module’s air supply. Only 25 cans are needed to protect for the SSP (Space Shuttle Program) mandated EOM+3 (End of Mission +3 days) margin. The six cans of margin will be transferred to the International Space Station at the end of the docked mission to bring the ISS LiOH stockpile to 30 unused cans. During the docked mission, Atlantis’s crew cabin CO2 removal process will be greatly augmented by the Station’s CDRA (Carbon Dioxide Removal System) and Vozdukh systems – which provide the equivalent of 29 LiOH cans for the Shuttle orbiter while docked. 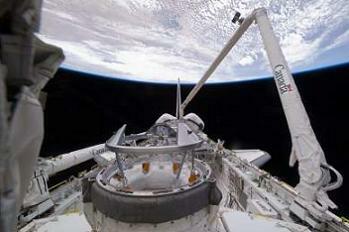 The STS-135/ULF-7 external payloads consist of the Multi-Purpose Logistics Module (MPLM) Raffaello (which will carry 16 racks and endcone stowage for maximum use), the Lightweight Multipurpose Experiment Support Structure Carrier (LMC) with Robotics Refueling Module to orbit and the failed ETCS Pump Module back to Earth, TRIDAR, and the Pico Satellite Solar Cell (PSSC). The mission’s middeck payloads will include three Animal Enclosure Modules (AEMs), NLP Vaccine/Cells, BRIC SyNERGY, DECLIC, and CUBE Lab. As with all Space Shuttle missions, STS-135/ULF-7 carries four main categories that group the mission’s objectives into priority categories. 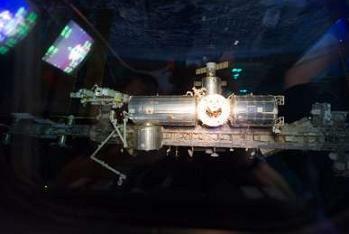 Unlike recent Shuttle missions which carried long lists of CAT I objectives (objectives that must be completed to ensure minimum mission success), STS-135 has only four CAT I objectives: Dock to the ISS and perform mandatory crew safety briefing, install the MPLM to Node-2 nadir, transfer critical items per the Flight ULF7 Transfer Priority List, and return the MPLM to Atlantis’s payload bay. These are the mission priorities that will be used to govern a shortening of the 135 mission should a post-launch Minimum Duration Flight become necessary. CAT II objectives include transferring all the CAT I and remaining payload elements from/to the MPLM to meet the minimum MPLM return mass properties of 21,000 lbs, removing the failed Pump Module from its ISS stowage location and moving it to the LMC in Atlantis’s PLB (Payload Bay), transferring the Robotics Refueling Mission payload from the LMC to the ISS, and deploying the MISSE-8 (Materials on ISS Experiment 8) to ELC-3 (Express Logistics Carrier 3). Lastly, the CAT III objectives include performing daily ISS payload status checks, transfer oxygen from Atlantis to the ISS, performing daily Atlantis middeck payload checks, performing ISS payload research operations, deploying the PSSC, and transferring water to the ISS from Atlantis. Following launch and orbital insertion on FD-1 (Flight Day 1), Atlantis’s four-person crew will get right to work in a crew-time modified work day (which will involve getting up closer to launch and going to bed later in FD-1 than usual). During FD-1 the standard post-insertion activities, NC-1 course correction burn, SRMS (Shuttle Remote Manipulator System, or robot arm) power-up and checkout, and FD-1 data downlinks of the External Tank umbilical well photos, hand-held ET video, and Wing Leading Edge Sensor (WLES) system data will be performed through MET (Mission Elapsed Time) 8hrs 30mins. 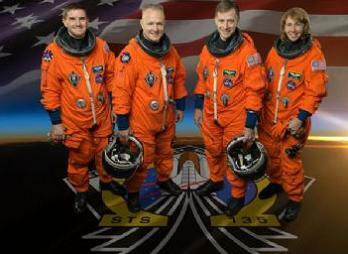 Normally, the flight crew ends FD-1 at the MET 6hr mark. FD-2 will be spent performing the standard inspections of Atlantis’s Thermal Protection System (TPS) Reinforced Carbon-Carbon WLE (Wing Leading Edge) and nose cap panels, T0 umbilicals, and upper flight surfaces with the Orbiter Boom Sensor System (OBSS). 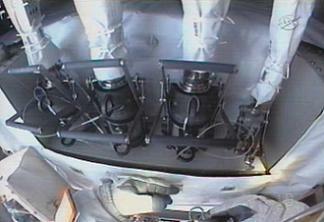 The crew will also take digital Hi-Res photographs of the OMS (Orbital Maneuvering System) pods. The NC-2 and NC-3 course correction burns will be also be undertaken on FD-2 as will Centerline camera installation, Docking Ring Extension, and Rendezvous Tools checkout. Then, on FD-3, Atlantis’s crew will begin final preparations for arrival at and docking to the International Space Station. Following a NC-4 course correction burn (if necessary) and the mandatory Terminal Initiation (TI) burn, Atlantis will arrive 600 feet “below” the International Space Station on the R-bar. 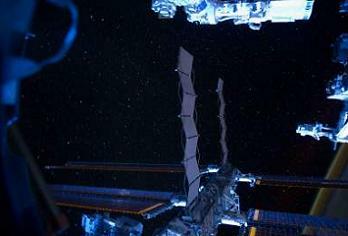 Here, Commander Chris Ferguson (who made his first trip to space on Atlantis and the STS-115 mission in September 2006) will guide Atlantis through a 7min, 360 degree back-flip R-bar Pitch Maneuver to allow the crew of the Space Station to take Hi-Res digital photographs of Atlantis’s underbelly TPS. The photography will allow ground imagery experts to examine and clear Atlantis’s entire TPS for reentry into Earth’s atmosphere. After the RPM, Ferguson will guide Atlantis to a point 300 feet ‘in front’ of the ISS along the Station’s V-bar, or Velocity bar (direction of travel). Once here, Ferguson will slow Atlantis’s orbital velocity by two-tenths of a foot per second in relation to that of ISS. The ISS will then play “catch up” with Atlantis, and once within proximity to the Station, Ferguson will increase Atlantis’s relative velocity by one-tenth of a foot per second – making the closing rate between the ISS and Atlantis one-tenth of a foot per second. With the proper alignment confirmed, the two vehicles will press to docking, linking up with one another at an expected time of 1109 EDT on Sunday, July 10 at MET 1day 23hrs 43mins – assuming an on-time launch on July 8. HISTORICAL NOTE: With docking on STS-135, Atlantis will become final Space Shuttle orbiter to dock to the International Space Station and the final NASA vehicle to dock with the ISS for at least the next six years. 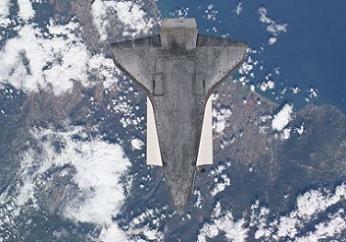 Atlantis was the first Space Shuttle orbiter and NASA vehicle to fulfill the program’s goal of docking to space station when she flew to the Russian MIR space station in June 1995. Following docking, the PMA (Pressurized Mating Adaptor) vestibule will be pressurized, leak checks performed, the hatches opened, and Atlantis’s crew welcomed aboard the ISS. Following a mandatory ISS safety briefing for the Shuttle crew, the OBSS will removed from Atlantis’s payload bay by the SSRMS (Space Station Remote Manipulator System, or Station robot arm) and handed off to the SRMS. FD-4 will see the removal of the MPLM Raffaello (making its first trip on Atlantis) from Atlantis’s PLB and its installation to Node-2 “Harmony” nadir. HISTORICAL NOTE: The flight of MPLM Raffaello on Atlantis will mark the first and only time that Atlantis will carry an MPLM to space and will make Raffaello the only MPLM to have flown on all three ISS-worthy orbiters (Atlantis, Discovery, and Endeavour). 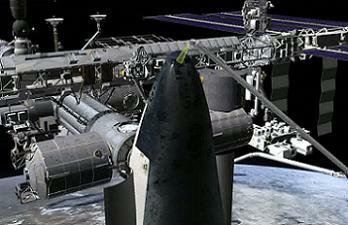 Following Raffaello’s installation to Node-2, MPLM vestibule outfitting and MPLM ingress will follow. Meanwhile, middeck transfers from Atlantis will begin on this day, as will CWC-I and PWR fills. EVA tool verification and EVA procedure review for Mike Fossum and Ron Garan will take place late in the flight day before the ISS/Shuttle crew heads to bed. FD-5 will then see Fossum and Garan (two ISS crew members) prepare for EVA-1 by conducting the In-Suit Light Exercise pre-breathe activity – first debuted on Endeavour’s STS-134 mission last month. The two will then perform the 6hr 30min planned spacewalk to return the failed Pump Module to Atlantis’s LMC and place the Robotics Refueling Mission payload on the ISS. MPLM transfers will continue on FD-5, as will CWC-I and PWR fills. The crew will also install the ZSR into the PMM (Permanent Multipurpose Module) Leonardo. 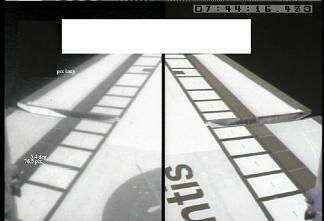 On FD-6, the crew will continue all transfer activities to/from the MPLM Raffaello and to/from Atlantis’s middeck. This will also be the day when a Focused Inspection of Atlantis’s TPS would be conducted if deemed necessary. Because of the tight nature of the STS-135 timeline, this is one of the only flights in the post-Columbia timeframe to not have specific mission time set aside for a Focused Inspection. Instead, should a FI be called, the time for the FI would be taken from planned transfer ops. Regardless of whether or not a FI is required, Atlantis’s SRMS and OBSS will be positioned to their undocking configurations at the end of this flight day. The crew will then enjoy a well-deserved day off on FD-7 before moving into EMU (Extravehicular Mobility Unit) checkout, resize, and transfer activities, crew conferences with news media outlets, and continued transfer operations with Raffaello and Atlantis’s middeck on FD-8. FD-9 will see further crew off-duty time and a water dump from Atlantis if needed. On FD-10, MPLM Raffaello will be closed up, demated from ISS, and returned to Atlantis’s payload bay by the SSRMS – with OBSS cameras providing LMC clearance views. Final middeck transfers will be completed between Atlantis and the ISS on this day as well. Then, with everything complete, the final farewell ceremony will take place before the hatches between the ISS and the Space Shuttle orbiter are closed for the last time. The next day, on FD-11 (July 18 assuming a July 8 launch), Atlantis and her four-person crew will undock from the International Space Station at MET 9days 14hrs 33mins. After spacecraft separation, the ISS will perform an axis rotation to allow for ±Y axis photo survey of the Station by Atlantis’s crew – which will be accomplished during the Space Shuttle Atlantis’ victory flyaround of the ISS. 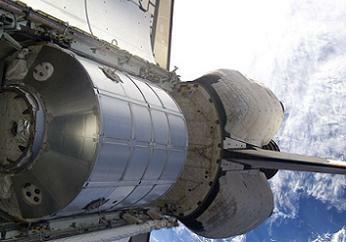 Atlantis’s crew will then perform the final separation burns to move Atlantis away from and ‘in front’ of the ISS. The remainder of FD-11 will be spent performing the late inspection of Atlantis’s WLE and nose cap RCC with the OBSS. Following the late inspection, the OBSS will be stowed for entry and the SRMS stowed and powered down. FD-12, or EOM-1 (End of Mission -1day), will see the crew deploy the Pico Satellite, perform the standard Flight Control Surface checkouts, RCS (Reaction Control System) hot fire test, L-1 (Landing -1 day) comm checks, and WLES deactivation activities. Cabin stow and reconfiguration for entry ops will also take place on this day. But perhaps the most memorable part of this day will be an on-orbit dedication of the Space Shuttle orbiter Atlantis by her final flight crew followed a STS-135 crew tribute to the entire Space Shuttle Program. Assuming a July 8 launch and nominal mission, the following day will be July 20 – the 42nd anniversary of the Apollo 11 moon landing. On this day, Atlantis’s crew will awaken and guide their vehicle back to her permanent home: the Kennedy Space Center – with Atlantis rolling to a stop on the KSC runway to complete the Space Shuttle Program after 30 years 3 months and 8 days of service to mankind.